Did you wait in line for Sonic? Give us your review! 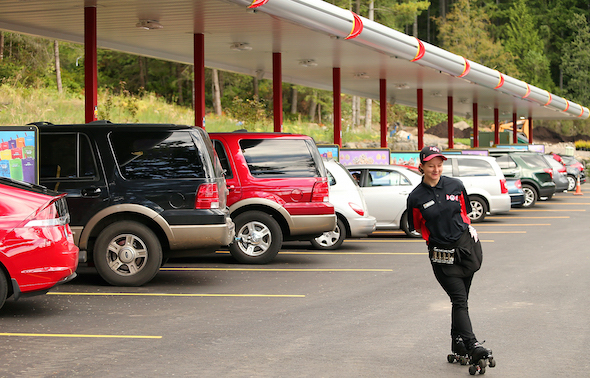 Poulsbo’s shiny new Sonic Drive-In made its long-awaited debut Wednesday. Judging by the lineup of cars along Viking Avenue, and the police officer directing traffic, it was a successful launch. Nothing seems to stir up excitement around here quite like the arrival of a new restaurant chain. So for those of you who braved the lines, I’m curious: What did you think? What did you order? How long did you wait? Are you an old Sonic fan or was this your first time? Did it live up to the hype? Was it everything your taste buds longed for? Only waited a short time===everything moved along quickly. Ordered coconut cream shake, pretzel dogs, chicken sandwich, foot long coney and and chili tater tots. Tasted just like I expected—-good as always. Always stopped at Sonics and were happy when one opened in Tacoma and more so now that it is in Poulsbo. Satisfied our taste buds today. Seven of us ate at Sonic drive-in service Thursday noon. Welcomed by a most pleasant woman while waiting in line. Easy, efficient voice ordering. Surprised at how fast the order was brought to the car. Dogs, BLT, shakes were great at good prices. Small hot dogs were perfect for young kids and light eaters.